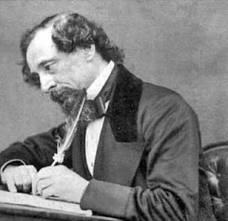 The novelist, Charles Dickens (1812-70) began his writing career 1. as/like a journalist on a London newspaper, and his novels were first published as serials in periodicals. Dicken’s most famous stories 2. contain/include Oliver Twist, Nicholas Nickleby, Great Expectations and David Copperfield. His works often highlight the injustices of life in the 19th century and David Copperfield in particular 3. is/are based on his miserable experiences as a boy when his father was imprisoned for debt and the young Dickens 4. working/worked in a blacking warehouse. Modern-day readers still enjoy his novels, many of which have been dramatised 5. in/on film and television. Every summer, Rochester in Kent, where Dickens spent much of his life, attracts Dickens lovers from all over the world to a 6. special/speciality festival celebrating the novelist’s life and work. It is perhaps Dickens’ comic portrayal of his 7. figures/characters which makes them so memorable and popular. They stand out not so much as living people, but as ’living cartoons’, as Dickens cleverly takes an obvious virtue or fault in a character and makes it 8. larger/largest than life. I just want to say I’m newbie to weblog and absolutely savored your web-site. Very likely I’m likely to bookmark your website . You really have outstanding articles. Thanks a bunch for sharing your web page with us. Hi there, You’ve done an excellent job. I’ll definitely dig it and in my view suggest to my friends. I am sure they will benefit from this site. Hi, I do believe this is an excellent web site. I stumbled upon it I will return again since I have book-marked it. Money and freedom is the best way to change, may you be rich and continue to help other people.